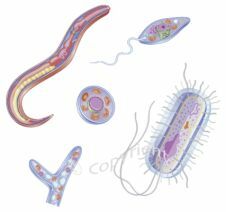 According to a report published in a Canadian magazine "Clean Life" 1/1 of October 1997, a parasite is an organism which lives at the expense of another organism, which could be any of us. A parasite lives parallel to our life inside our body. It uses the energy supplied with the food and feeds on the cells of our body. It takes advantage of the vitamins which we take thinking about our own health. How do parasitic infections spread? Statistically, 70-80% people are likely to get infected. A phenomena of parasitic inflections is more common that it may seem. A probability that we have managed to live 20-30 years, not to mention more without this type of infection amounts only to 20-30%. The beginnings are innocent: infested food, unclean vegetables and fruit, uncooked meat or fur or our pet. However, the biggest numbers of parasites are present in port products commonly available for sale: in bacon, ham, sausages, hot dogs or even in fish. Let's have a closer look at the case of a port tapeworm. It gets inside the human body by consumption of infected smoked ham, sausage or uncooked pork. The tapeworm larvae develop in muscles, in the heart muscle, in the brain, in the eyes by attacking these organs with poisonous side products. We should remember that the parasites may go through a latent period and show their presence only by means of such symptoms as exhaustion, lack of strength and energy and other signs listed on this page below. Where do we find the biggest numbers of parasites in our body? fermenting and decomposing faeces. However, it is only a part of the truth. Organisms which damage our immunity by producing toxins and causing pain may be present also in the lungs, liver, muscles, joints, brain, gullet, blood" on the skin, in connective tissue and even in the eyes, nose and ears. What are the typical symptoms of parasitic infections apart from parasite-caused diseases? Is the traditional three-day laboratory stool-testing method enough? The only method for discovering presence of parasites in the stool is observation of their eggs under the microscope. If when the sample was taken a parasite laid eggs, the result of the test will be positive and it will confirm the presence of parasites. This type of test will shorten the time of obtaining the information about the large intestine we need. Nevertheless, it will not tell us anything about other internal organs/ If we receive a negative result or if we want to know more about the remaining areas of our body, we are left with self-observation. There is a very long list of symptoms which co-exist with the presence of the parasites in our body, apart from specific diseases which they cause. The most frequently mentioned ones include: constipation, diarrhoea, gases and winds, irritable bowel syndrome, muscle and joints pains, sleeping disorders, bruxism - grinding the teeth, chronic fatigue even following a sufficient amount of sleep, irritability for no reason, lowered immunity, ulcers, skin problems, allergies, anaemia, excessive loss of weight despite suitable intake of food, excessive weight gain caused by huge appetite resulting from insatiable hunger, unpleasant taste and smell in the mouth, acne, migraines, etc. - British scientists discovered This information comes from the latest issue of "New Scientist"
Popularity of mobile phones makes many scientists interested in the research on safety of the use of such devices. So far, the research has focused mostly on the influence of microwaves on the brain, connected with heating the fibres by the waves. Microwaves (also radio waves) are shorter than the usual radio waves, but longer than infrared radiation. They are 0.3 - 30cm long, which is equal to hundreds of megahertzs and hundreds of gigahertz. They are used in radars, telecommunication, and, naturally, in the microwave ovens. Microwaves' energy is too small to damages the chemical bonds in the cells - it is only when their power is strong enough to significantly increase the body temperature that the damages can occur. As far as power is concerned, the telephone cannot be compared to a microwave, therefore the risk of harmful influence of human tissue (in respect of thermal impact), especially on the human brain, seems to be insignificant. However, the team of David De Pomerai from the University of Nottingham in great Britain discovered an effect which cannot be explained by heat influence of the microwaves. 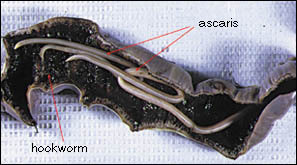 Small worms from the roundworm class, when subject to influence of microwave with frequency and energy the same as in case of a mobile phone, produced an increased number of eggs.It could not be an effect related to heal production, as too high temperature makes the larvae develop into infertile adult forms. Earlier works of the same team had proved that under the influence of the microwaves the roundworms produce protein related to stress and become 10 per cent larger than usually. Nevertheless, during the research at that time it was impossible to exclude the heat impact (it is very difficult to measure body temperature of tiny roundworms). So far, a credible explanation of increased worm fertility has not been provided. Perhaps under the influence of microwaves the protein particles take another shapes and become more active. There is a controversial hypothesis that in the cells microscopic "hot spots" with higher intensity of radiation are created. We don't know whether and in which way the telephones influence human fertility. The results have caused great interest among independent specialists, who are waiting impatiently for further research.